The old rum 2001 vintage from Saint James has been aged in oak barrels for more than 10 years which allowed for a finer extration of flavours. 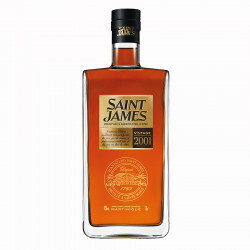 Saint James rum vintage 2001 meets all the requirements of the AOC of agricultural rums from Martinique. The 2001 harvest was exceptional in terms of the quality of the canes giving a very round rum, very fruity and suave. More than 10 years of aging in oak barrels, the development of this vintage has revealed the full range of aromas, a patient exchange with the barrels. This subtlety due to the original spirit has allowed a finer extraction, where the woody presence mixed with undergrowth combines with sweet spicy notes of cinnamon on a more lively background of nutmeg. Saint James is the inventor of vintage rums since 1885. The distillery of Saint James was born in 1765, at the foot of the peeled mountain, on the island of Martinique (St Marie). It is the most important producer of agricultural rum of the island, but also the most famous , even owning a rum museum. Located on the heights of St Pierre in the 18th century, it was transferred to Sainte Marie following the eruption of the volcano of the peeled mountain, which charred the entire sugar cane fields, except for a part: those of the St James plantation. Still active today, it would produce around 3 million liters of rum a year, making this distillery the largest producer of agricultural rum on the island. Colour: brown with mahogany shades. Nose: intense aromas of cocoa and roasted coffee balanced with notes of dried fruit. Palate: generous and suave, with powerful woody and fruity notes. This rum was awarded with a gold medal at the world competition in Brussels in 2017.